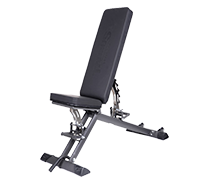 The weight bench of the range of Men’s Health convinces by an easy-to-use quick lock adjusting system. Due to the short training break, the workout becomes more effective and more diverting. The practical shelf spaces below the bench offer space for two compact weights or dumbbells. The curl pult offers the possibility of a highly effective biceps training with its SZ bar.